(Syracuse)The State University of New York College of Environmental Science and Forestry (ESF) chapter of Engineers Without Borders will be on the windward island of Dominica from December 30, 2004, until January 15, 2005. There the students will join forces with electrical engineering students from the University of Vermont to complete installation of a micro-hydro turbine to replace the diesel generator at the Archbold Tropical Research and Education Center. Mary Gifford (senior), Ayana Douglas (senior), Megan Scott (sophomore) all Environmental Resources and Forest Engineering students. They are carrying cinder blocks down to build the foundation for the turbine and generator. Ayana is from Dominica, and so this project allowed her to visit her homeland. Mary is the President of the local chapter of Engineers Without Borders. Mary Gifford of Albany, N.Y., president of the ESF EWB chapter, said the ESF students are very excited about this project. "Dominica is not a high income nation and the cost of diesel fuel is two to three times what it is in the United States. But Dominica has a lot of natural resources, like fast moving rivers, which can spin turbines and make energy that's renewable." In fact, rainfall in Dominica averages 300 inches a year and the project at Archbold Center taps a stream running through the property. A concrete intake has been constructed on the side of a hill and water will be directed through 600 feet of PVC pipe, dropping 140 feet into the micro-hydro turbine, spinning the turbine to generate electricity. Then the water returns to the stream. Student Megan Scott of Dunkirk, N.Y., said, "I wanted to find out why I'm in engineering, and I knew there was a reason. Once we started planning this project I knew why, it's an opportunity to help." She explained, "We're getting something out of it; they're getting something out of it. I take all these classes and learn all these formulas and theories so now I get to put them in action." Michael Miller of East Syracuse, N.Y., a senior at ESF studying hydrology, calls this project, "The chance to get some hands-on experience plus what we're doing should be really helpful to the people there for developing renewable energy resources." Gifford said they hope this micro-hydro turbine project serves as a model for similar innovation. "Energy is needed to develop hotels and other services to build the eco-tourism industry on Dominica so they can take advantage of the island?s ecological diversity," she said. The SUNY-ESF EWB chapter has 20 members; six are taking part in this particular project. Each student pays his or her own travel expenses, but room and board is provided and the materials needed for the project are being secured by ESF. During the spring semester, the participating students will make a presentation on their work to the ESF Board of Trustees. 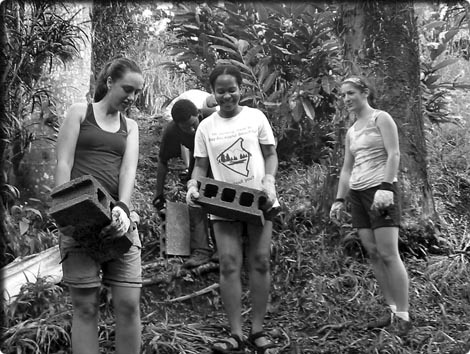 Engineers Without Borders was formed in 2000 by Civil Engineering faculty at the University of Colorado at Boulder to help install a water delivery system in San Pablo, Belize. Since then chapters have been organized at a number of colleges and universities around the United States. For more information see www.ewb-usa.org. Dominica, a former British colony, is about 2400 miles from Syracuse, located north of Barbados and south of Antigua, part of the windward islands that separate the Atlantic Ocean from the Caribbean. It is considered a living laboratory with pristine rain forests, fertile volcanic soils and abundant fresh water. Dominica boasts a river for every day of the year. SUNY-ESF offers a three-credit course on Tropical Ecology, the field portion taught in Dominica during spring break. The Archbold Tropical Research and Education Center is directed by a consortium of colleges and universities, SUNY-ESF and Syracuse University are charter members because of their strong connections to philanthropist John D. Archbold. The center is located on Springfield Plantation and Mt. Joy Estates, a gift from Archbold to Clemson University. The Center is just three miles from Roseau, the capital of the commonwealth. Adjacent to the Center are the Morne Trois Piton National Park and Archbold Preserve, a tract of tropical rain forest. The other SUNY-ESF students working on the micro-hydro project include: David Norton, Camden, N.Y., Junior, Environmental Resources and Forest Engineering; Ayana Douglas, Nyack, N.Y., Environmental Resources and Forest Engineering; and, Peter Simpson, Elbridge, N.Y., Forest Engineering.